On the second day, my friend had to work on a shuttle flight to Jeddah (I think that’s where she went), so I had the whole morning till late late afternoon to myself. I couldn’t go back to sleep after her morning call which was at what.. 6am?! So I really took my time washing up and went downstairs for breakfast (it still wasn’t 7am by that time), where I took my sweet time eating food I wasn’t really hungry for and looking at Flipboard and iMessaged my dear friends back in HK… then sleepiness kicked in and I went back to my to lie down. What a life! I know, right? I had planned to go swimming and then take the shuttle bus to a mall; and it all happened up until I went downstairs for the bus and the guy tells me the bus left early… but I was early too! 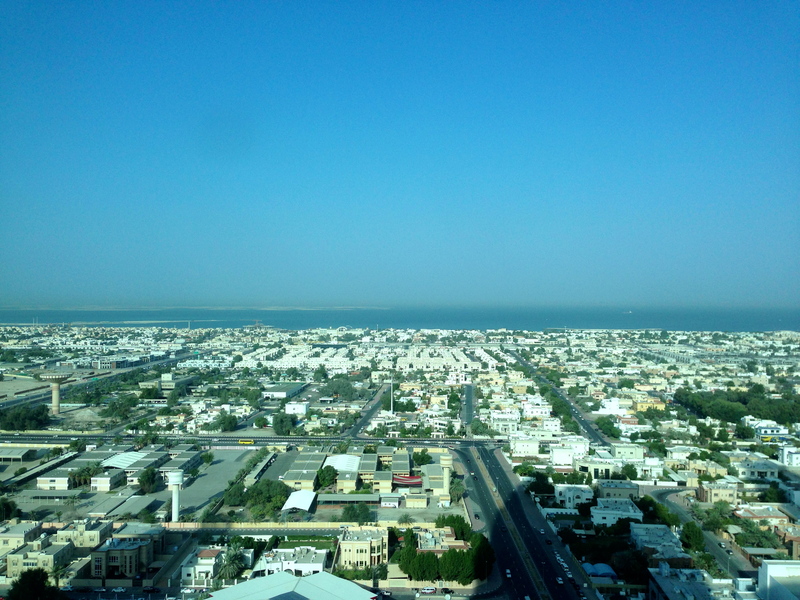 I thought about cabbing it there but it was kind of far and as I said, I don’t have great Dubai taxi skills. So… you guys are going to kill me for this: I went back to the room and passed out for almost three hours. HAHAHAA I can’t believe it either, but I was feeling kind of sick okay? The flight to Dubai was filled with coughing people and I was wearing a thin t-shirt and fighting a flu and whatnot. HA. DID I TELL YOU GUYS WHAT HAPPENED ON THAT FLIGHT??? My nose was blocked so I asked for some hot tea to sniff the steam, and as it cooled down I put it closer to my nose ’cause that steam just wasn’t doing a splendid job at finding my nostrils anymore. I kept doing it until I SNIFFED HOT TEA UP MY NOSE!! I’m just so glad the person next to me was completely passed out. I was already embarrassed enough to cry from watching movies on the plane. Oh right, so I slept for almost three hours (HA. ), and realized I haven’t had lunch, so I went downstairs to this amazing Middle East/Indian/”Chinese” restaurant behind the hotel (Shangri-La) for some late lunch. This is called the Chicken Kaboosh or Kamboosh or something. They put a lot of spices in the rice. 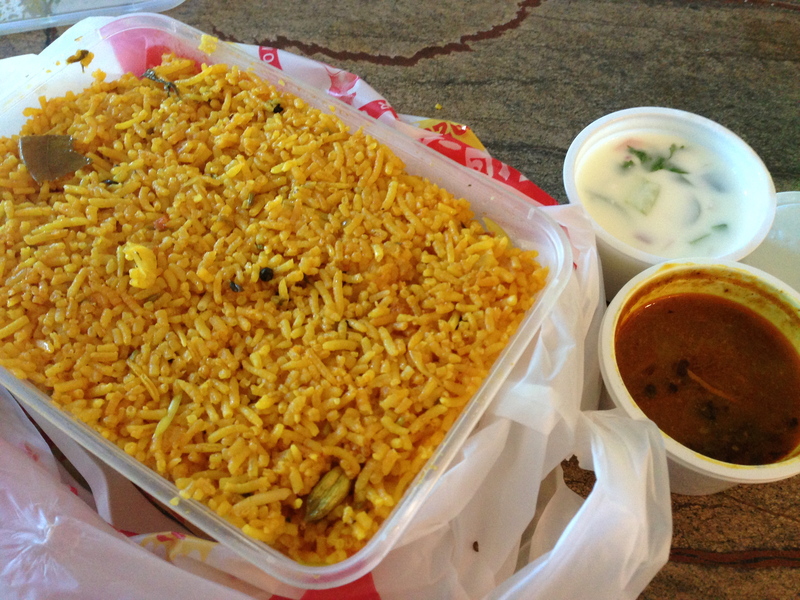 It’s kind of like that Indian yellow rice, but this has much more flavor; kind of sour-ish. I think it’s from this thing that looks like capers, but it doesn’t feel edible. They also have little black round herbs that look like tiny peppercorns, and boy, biting into them is not so fun. I guess the locals just eat it all, but eating rice and having to spit stuff out for me was a bit too much. You may have noticed that I said chicken, and there was no chicken in the first pic. Here it is, it’s massive and you either had to turn the box of rice over a plate, or dig it up and spill rice ALL OVER THE TABLE. Or you could eat the rice until you find the chicken. I don’t know why this had to be so much brain work for me. Sure, I had trouble finding my chicken, but this restaurant is pretty amazing. I actually ate here all three days of my trip. Their butter chicken and roti prata is pretty good. If you’re ever in Dubai, this is behind the Shangri-La, right outside a small shopping complex which has a huge supermarket. It has this sign on top of the building that looks like the Olympic rings. It’s easy to spot, and if you do, you’ve found the right place. Sorry I didn’t take a picture of it, but I did take a picture of this restaurant. It’s called MFC and I checked, it doesn’t stand for Manly Fried Chicken. What a let down. 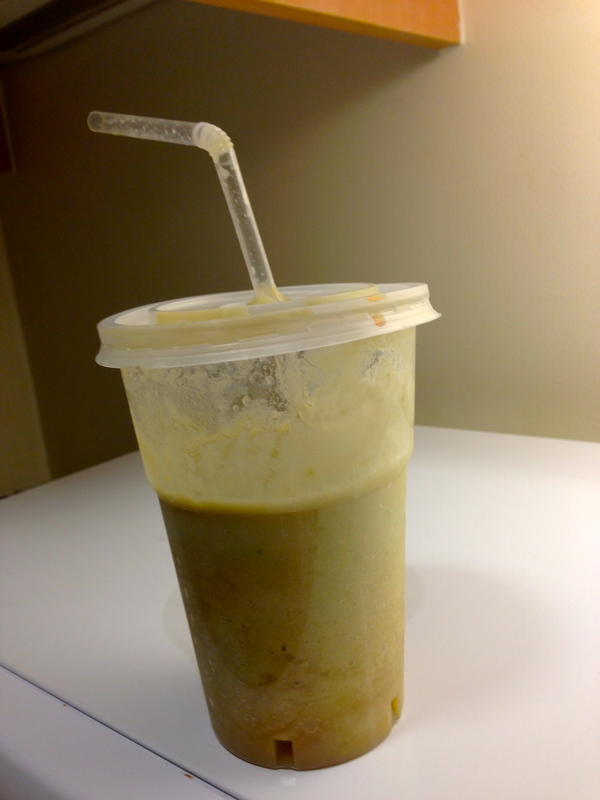 If you do find MFC, you should try their avocado shake too. I know it looks super gross in this picture, but when I took this pic the thing has been sitting in our fridge for a day. Please don’t ask me why we didn’t just throw it out. Okay fine, it was THAT good. It’s a really thick shake and that brown stuff you see is actually vanilla essence, I’m pretty sure. It’s filling, so it’s better to share this and some butter chicken with friends, if you have any. HAHAA I’M JOKING, CALM DOWN. 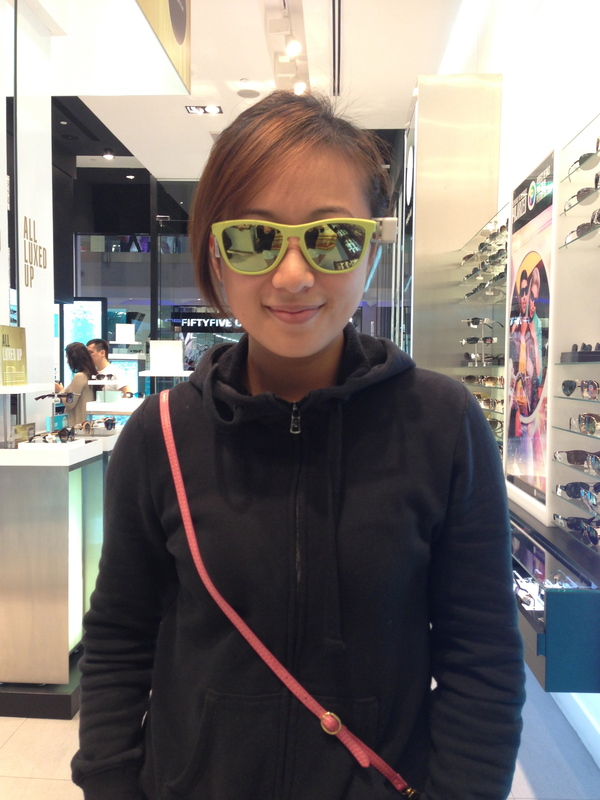 When my friend finally came back we caught the shuttle bus and went to Dubai Mall. They have this ridiculous aquarium in the middle of it but it’s kind of like… “I’ve been to Ocean Park and that crazy aquarium in Okinawa too… so… let’s move on.” After that we went for dinner at the Cheese Cake Factory. 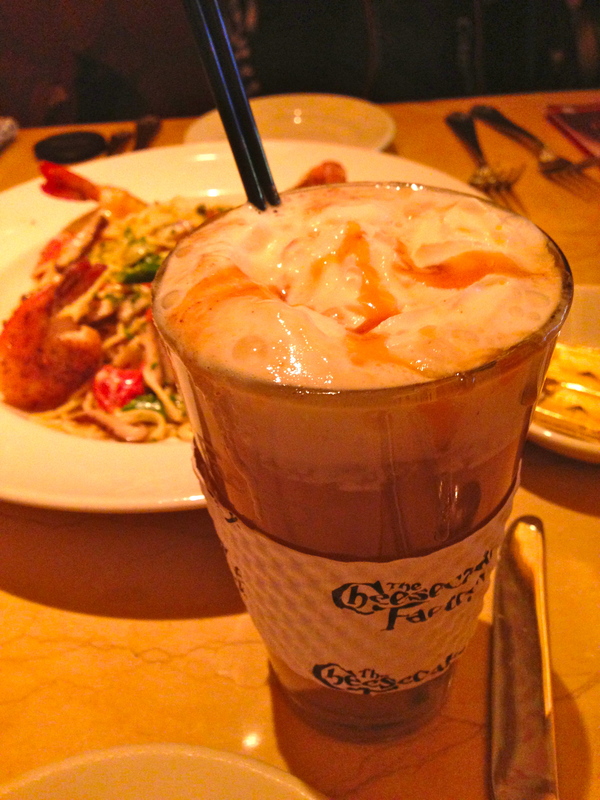 I was super full from my late lunch, but uh… dinner’s dinner, right? 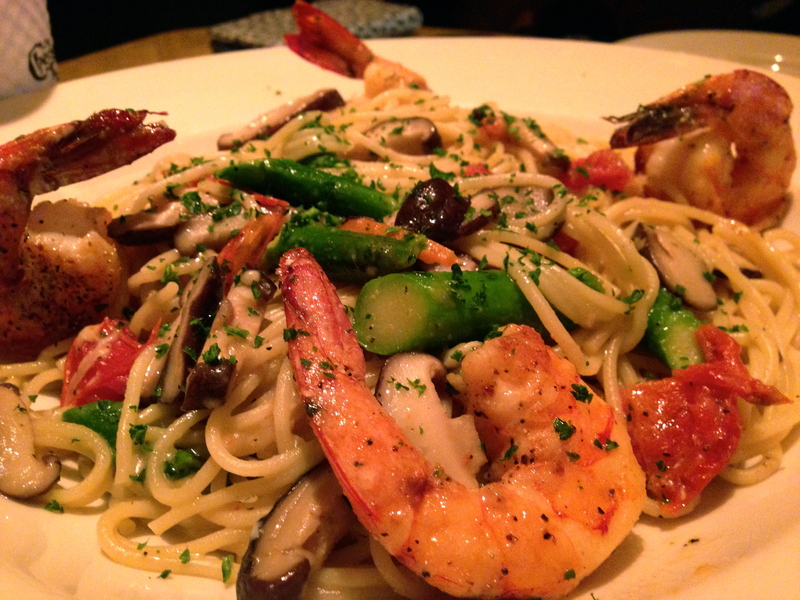 We shared this garlicy-shrimp-asparagus linguine thing and it was pretty amazing. We had left overs and demolished it the next morning. 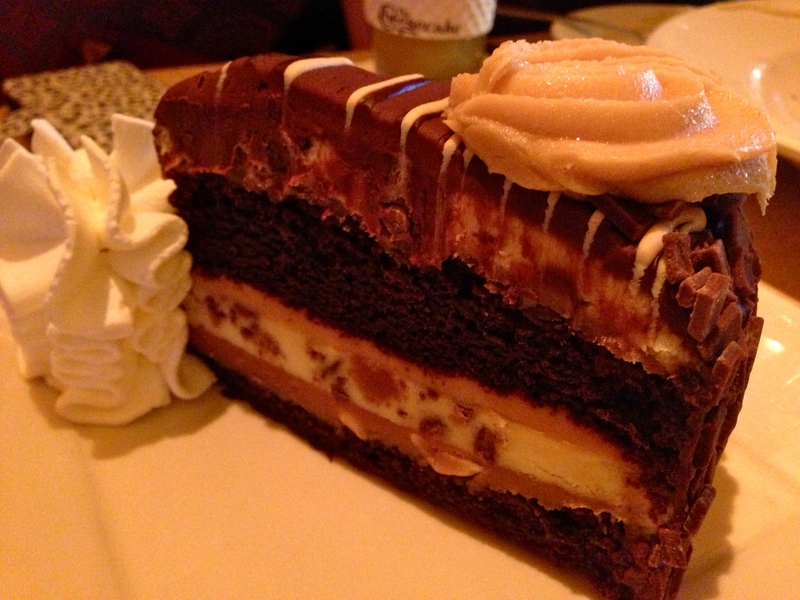 The Reese’s Peanut Butter Chocolate Cheesecake. Seriously, it was soooooooo good, but we could only finish about a third of this thing. We took the leftovers with us but no one wanted to touch it again. The point of going to Dubai Mall was really to see the Burj Khalifa, the tallest building in the world. We walked out to where it was and the place was mad packed. We went into the “let’s take a picture and get out of here” mode, and did exactly that. I’d say we’re pretty good at it too. Okay, we left, but we came back. 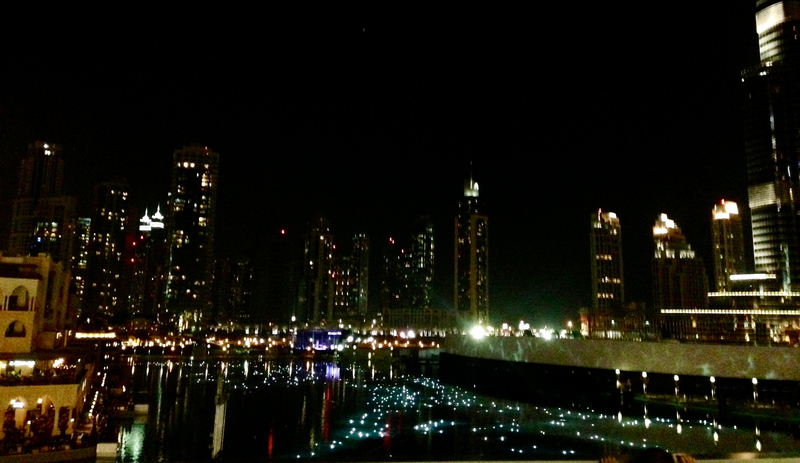 Every night at 9 there’s a light show at the lake and it’s such a big deal… and a let down. It went on for literally about one minute and stopped. It was quite spectacular since the area is so big, BUT. IT. STOPPED. So after a bit of feigned innocent surprise which was really just complaining, back to the shops and I bought this 😀 And then I was practically falling asleep as I was walking (YES, EVEN AFTER MY THREE HOUR NAP) so we cabbed back, which is when my ‘elegant’ friend gave the cab driver a piece of her mind. 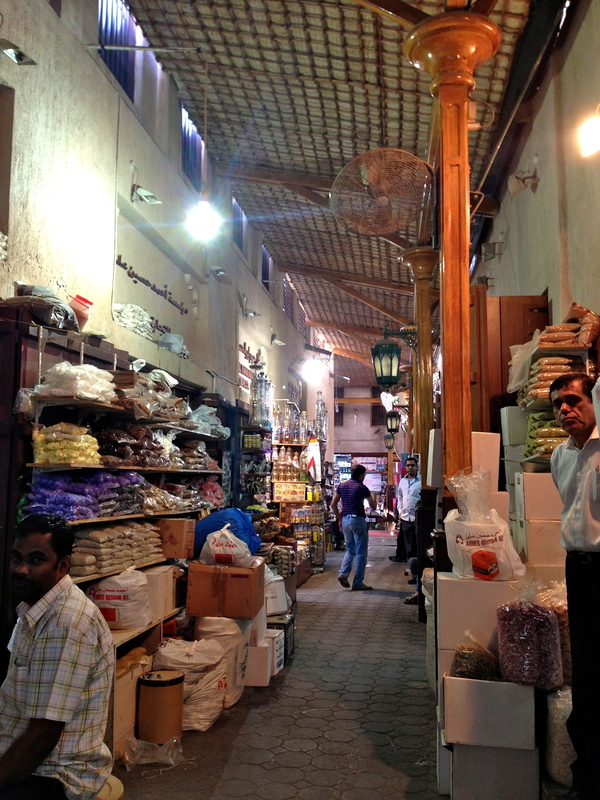 We took the metro and went to Al Ras, which is where the gold souk (market) is at. 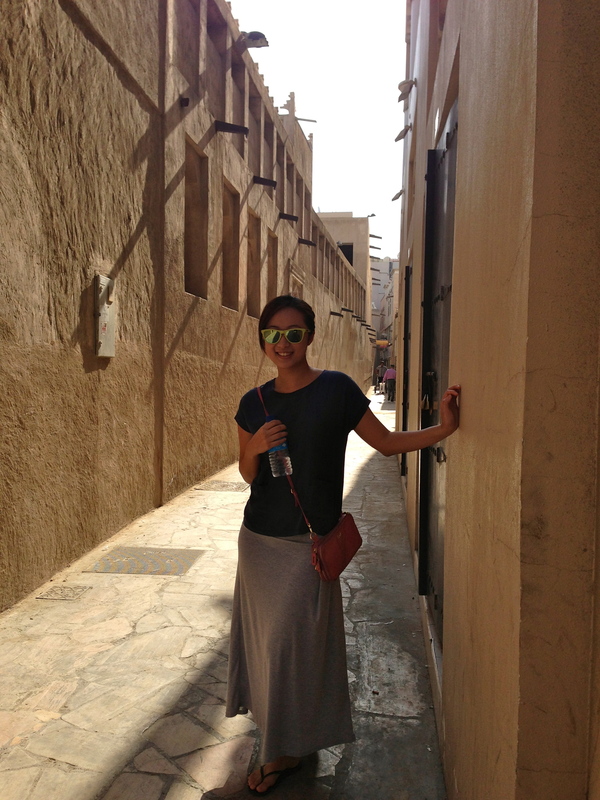 It was really the first time we wandered in a local area but all worries left our minds when we found this little alleyway that looks like it’s from Aladdin. 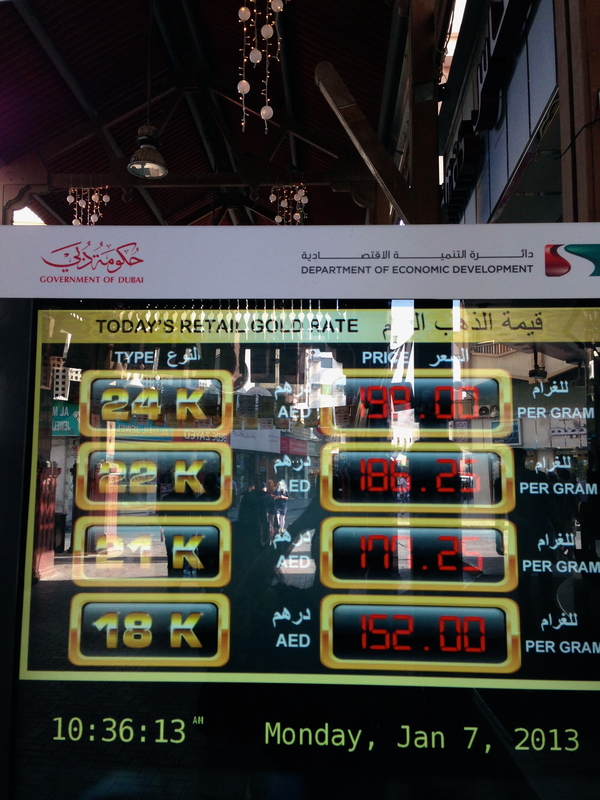 We thought about getting something small since gold in Dubai is supposed to be really cheap. We met a super nice Filipino guy the night before and he told us all about buying gold, but when we got there there was so much going on that we just wanted to turn around and go look at that shisha pipe we saw earlier on. 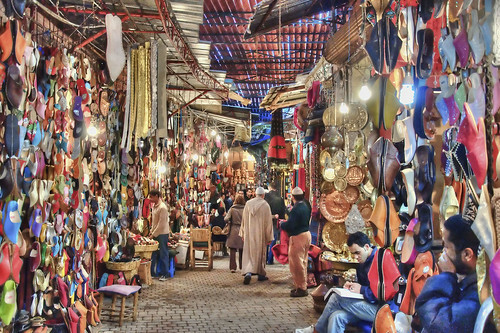 I’m a fail blogger, and that’s why I went from talking about the gold souk to posting this picture of another souk. I went for the gold market and didn’t take a picture of it. That’s just what I do. My excuse – I mean reason, though, is that everything was so modern. Perhaps I just didn’t find the ‘right’ souk, whatever that’s supposed to mean, but I really thought it’d be like the markets in Istanbul or something that I see on Lonely Planet. Yea, I didn’t take my own picture but I googled it and posted it, SO WHAT!!!!!!!! I’ll just be the fail blogger from now on, geez. You know what, I might as well be a fail tourist too. We were right next to this river which is supposed to be beautiful and you can do a really nice boat ride for next to nothing but we wanted to go back to the hotel and have lunch before we flew back to HK. Hahahahaa. Keep your blog updating, I’m so eager to see them! 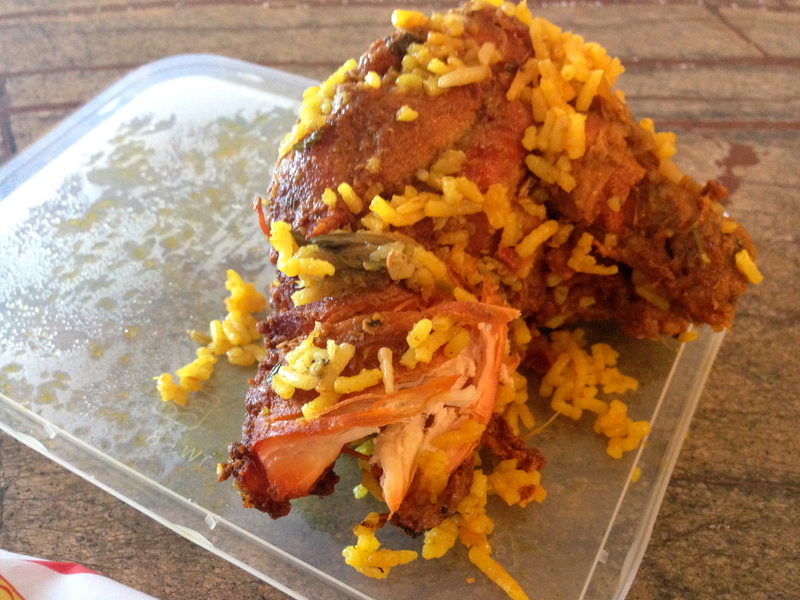 LOL…that is one large piece of chicken with yellow rice you had there! I’m worst than you. I travel without a camera.